Detectives investigating a sickening attack on a teenage girl in Dunmurry at the weekend have appealed for witnesses to come forward. The 15-year-old was waiting at the railway halt with a friend at around 10:10pm on Saturday (July 8) when she was struck in the face by a brick that had been thrown from the far side of the platform. She sustained a fractured eye socket, facial lacerations and a suspected detached retina. 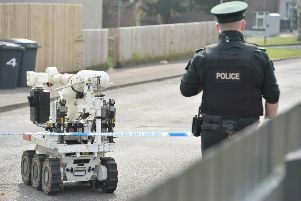 Condemning the incident as “an awful and despicable attack”, SDLP Councillor Brian Heading said: “Whoever threw the missile needs to hand themselves over to the police and parents need to ask questions of their own children as to there whereabouts on Saturday night. Anyone with information about the attack is asked to contact investigating officers on 101, quoting reference 1525 08/07/17.